With a headlight on my messy hair, I try to squeeze out of my two layers of thermic underwear, which seem glued to my sweaty body. I unfold my self-made pillow and stuff the hiking pants and fast-drying towels in my bag. After checking twice nothing is left behind, I crawl out of the tent. For the first time in three days, I manage to do so without spilling the tea leftovers and wetting the entire yellow cover. Outside I tie my blistered feet in my dusty hiking shoes. 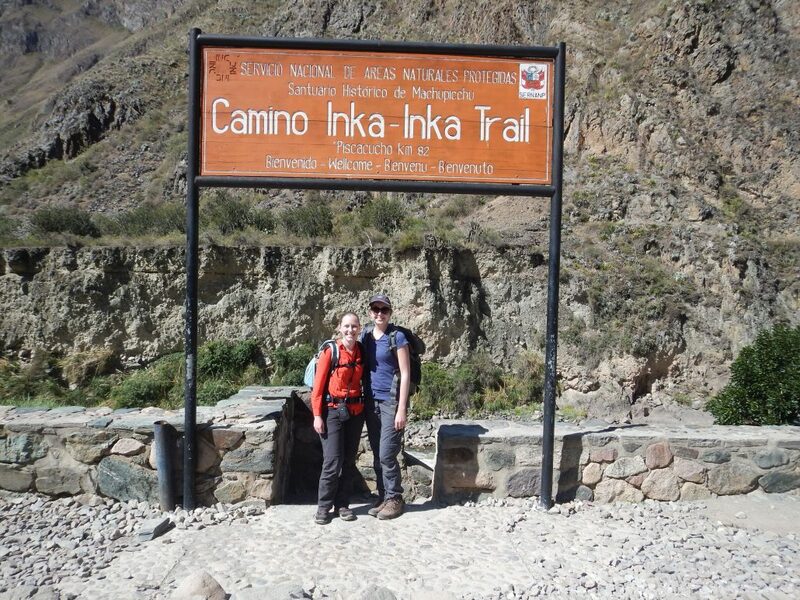 Ready for the fourth and final part of the Inca trail. My travel companion is waiting at the breakfast table, chatting to the porter who acted as our alarm clock ten minutes earlier. It’s hard to guess his age, but he looks old enough to be my dad. The wrinkles on his forehead and the grooves in his cheeks reveal a strenuous life story. The trail has been his work place for the past ten years. 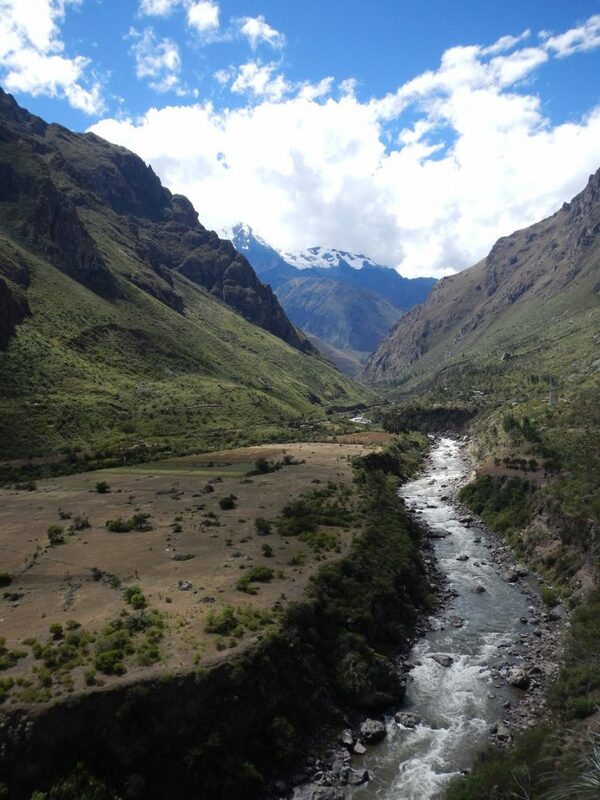 Raising five children in the outskirts of Cuzco, it seemed like a sensible way to make money. In the meantime, his knees have become weaker and his feet are covered in calluses. Yet still on each trip, his delicate back bears over twenty kilos of kitchen gear and passengers’ luggage. I look at his worn out shoes and wonder how he does it. I haven’t caught him complaining once. Instead, he seems rather content with his home away from home. Focused on what he does have. Comradeship, laughter and folkloric music that comes off as an irritating jingle to tourists, but sounds like heaven to him. Once breakfast is finished, my travel companion and I shake his hand one last time, both as a thank you and a goodbye. We stop by the toilet facilities and take turns barricading the door and holding the toilet role. I try counting the stars while holding my breath to ward off the dreadful smell. Before we take off, I throw some cold water in my face. Already yearning for the comfortable shower awaiting me later on. I lift my backpack and pull the straps tight around my waist. I follow my travel companion and our guide towards the exit of our campsite. When we arrive at the final control post, twenty some hikers have already gathered in front of the modest office. The three of us queue up as well and I take a seat on the wooden bench. And so it begins, our two and a half hour wait in the dark for the office to open. With the end of the trail in sight, my mind wanders off to where it began. At a kitchen table, six months ago. It’s early December, and winter is knocking on the door. Perfect timing to plan early summer holidays. Instead of my usual solo trip, I’m teaming up with my lost-but-found high school friend. She sits across from me at the table, examining the Lonely Planet version on Peru. A no-brainer when it came to picking the destination. 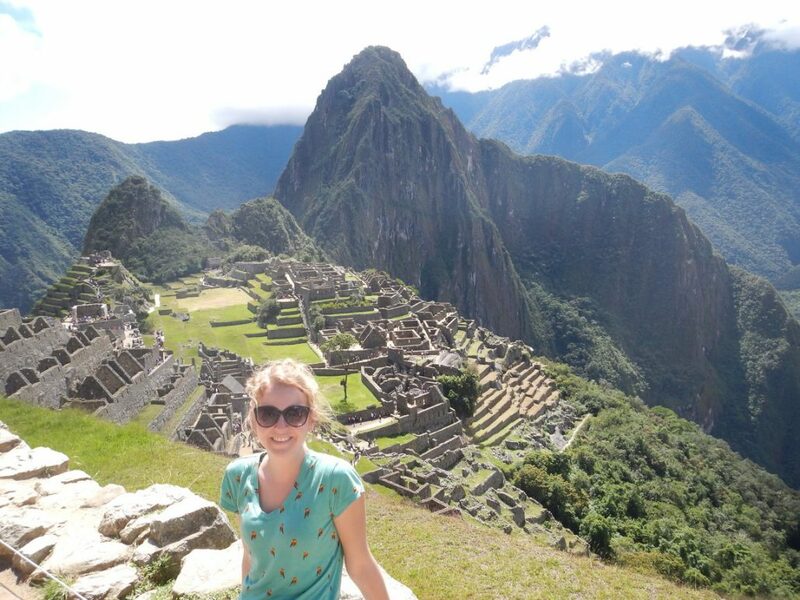 She mentions some places worth visiting, but the one I’m waiting for is Machu Picchu. The world wonder that’s been on my wish list ever since I was able to spell it correctly. 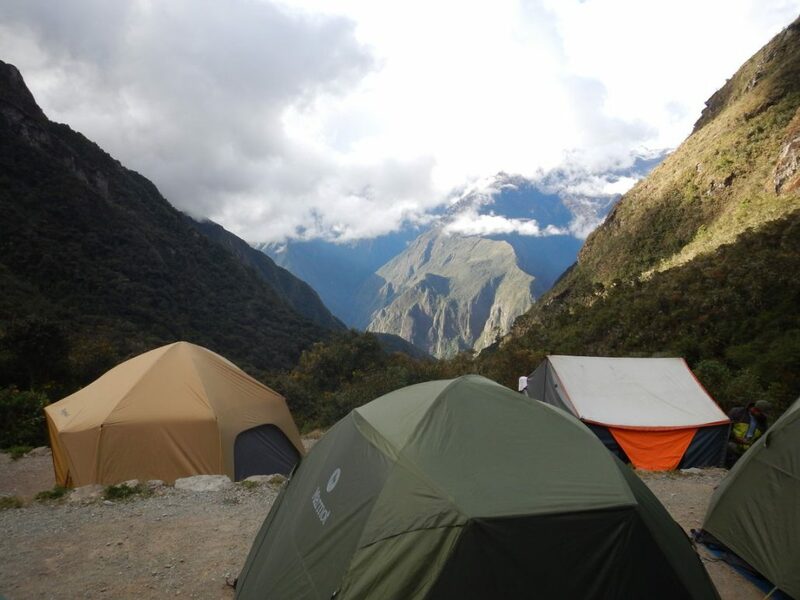 If we want to hike the classic Inca trail leading to Machu Picchu, we have to sign up now, before all available places are sold out. 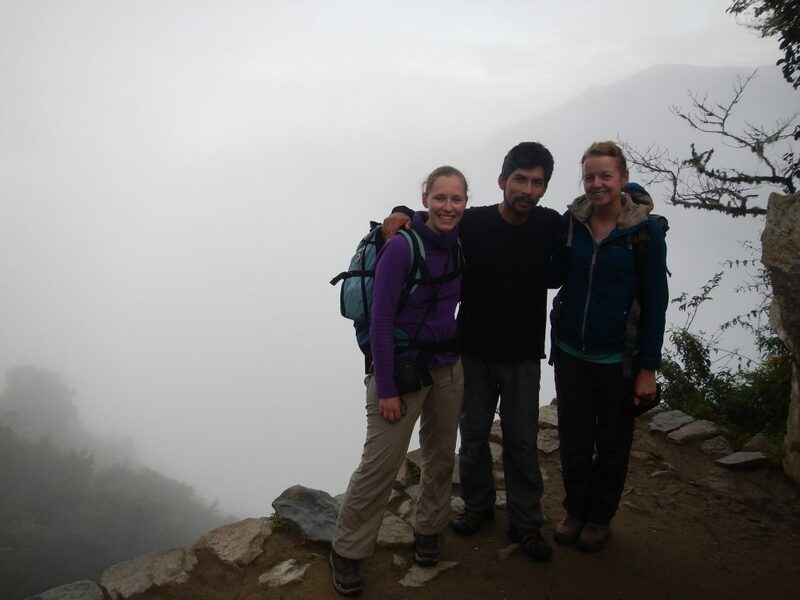 Four days climbing and descending a path leading along impressive Inca ruins. 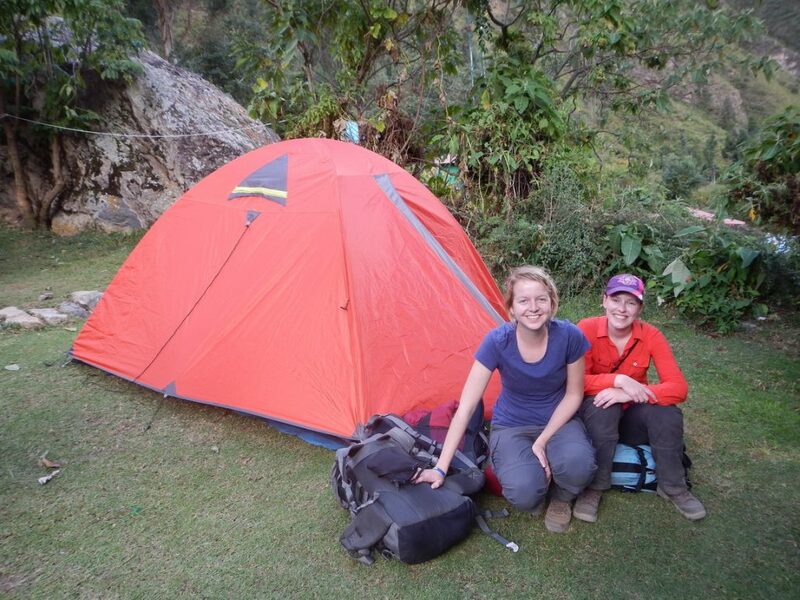 Or we keep it laid-back and choose the more muscle-friendly option of a one day hike. “Are you sure?” She frowns. “Are you fit enough?” She frowns again. It immediately became my main New Year’s resolution, getting that unfit body of mine back into the shape of its younger, slimmer days. Yet by the end of January, my running shoes were still hibernating somewhere at the back of my shoe closet. February rolled on. Too cold, too many never-ending showers to stretch my legs out in the fresh air. Instead of on a treadmill, me and my winter blues spent our evenings on a comfortable couch. February became March, March slowly turned into April. With a mere three weeks to be crossed off the calendar, nerves started kicking in. In a last-minute attempt, I tried to save whatever could be saved. The nightly power walks around the block were the best I could do. I shuffle around on the wooden bench. Still pitch black outside. For the fifth time, I ask my neighbour Joseph what time it is. He merely shakes his head and takes another bite of his sandwich. A nearly retired teacher in a small Spanish village near the Pyrenees, he travels for six months in a row each two years. Perks of his birth year and his government job. Every night at dinner he would treat us to fascinating stories of the most remote places. I close my eyes and start eavesdropping on the conversation of the American lady on my right. Just hit thirty. Got stuck in a complicated divorce. Packed her bags and booked a one-way ticket. In need of a mental catharsis. I agree with her – physically the trail has been a tough challenge, sucking every last bit of energy out of me. Yet I can’t seem to remember a time where I’ve been mentally more at peace. 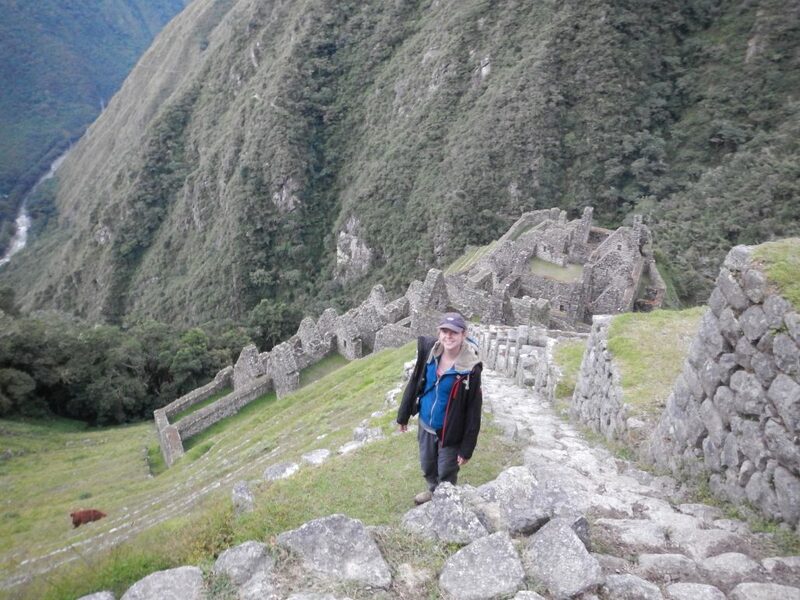 Always pondering, my thoughts have converged to one mere reflection: making it to Machu Picchu. I have no clue how long I’ve been listening in, but suddenly the line starts moving. The final stretch seems to last forever. I’m waving my flashlight from left to right, while peering at the trail ahead of me. Unlike the previous days, I’m surrounded by other hikers in front and behind me. The pace quickly picks up and I find myself in some sort of race walking mode. Driven by a tangible excitement, we’re all trying to make it to our final destination as soon as possible. I imagine the Sun Gate can’t be far off, yet behind each bend the trail appears to continue endlessly. While climbing up steep stairs on hands and feet, I feel my leg muscles protesting. Like they have woken up in a bad mood, pleading for it to be over. I feel a slight sense of relief when I notice the girl behind me struggling as much as I do. No doubt she mirrors how I look: a face that’s on fire, sweat dripping from every pore. We’re both forced to get out of the way for three older men who effortlessly pass us by with their professional hiking poles. What I wish I knew before departing – preparation is everything. 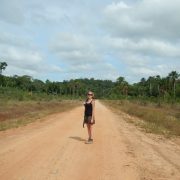 My travel companion and our guide start slowing down. 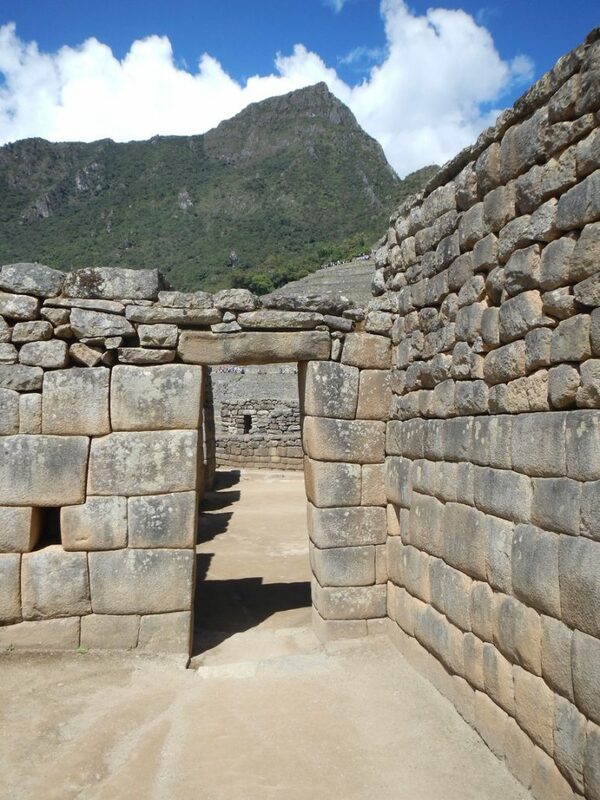 This is it: we’ve reached the Sun Gate, once the main entrance to Machu Picchu. I take a deep breath to prepare myself for the beautiful sights I’m about to take in. Yet when I stare into the distance, I can’t even see a hand before my eyes. Fog has covered everything under a mysterious sheet. “Well, it is what it is,” my travel companion shrugs. She is, after all, ever the optimist. “The fog might fade away soon, so we’ll stay here for a while.” Our guide’s attempt to sound reassuring fails tremendously. I can’t hide my disappointment. 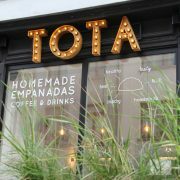 I have dreamed about this place for so long. Over the past three days, I have pushed my limits, suffered from altitude sickness, endured headaches due to the burning sun. All to see this. Nothing at all. Half an hour passes, but the fog remains. I glance at other hikers, but to my surprise I can’t make out any faces that look as baffled as mine. They seem relaxed, enjoying the break. Slowly but surely the tension eases. Above all, I made it here. I might have anticipated a stunning sunrise, at least my dream no longer remains just that. While we walk down, the clouds seem to move along with us. The guide calls for another break halfway. 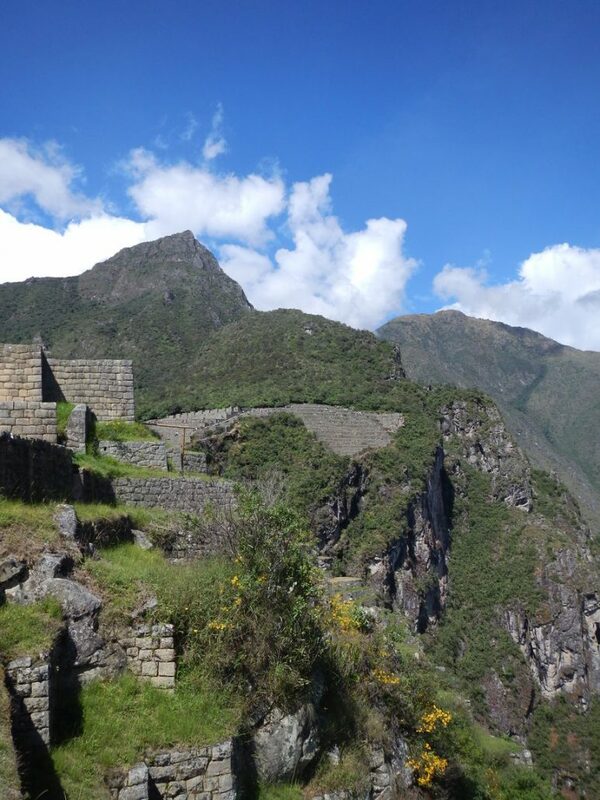 By now, the sky seems a bit clearer, but I still can’t make out the Inca citadel in front of me. I try to shift the focus to what I have been able to marvel at so far. The weather conditions are out of my hands anyway. 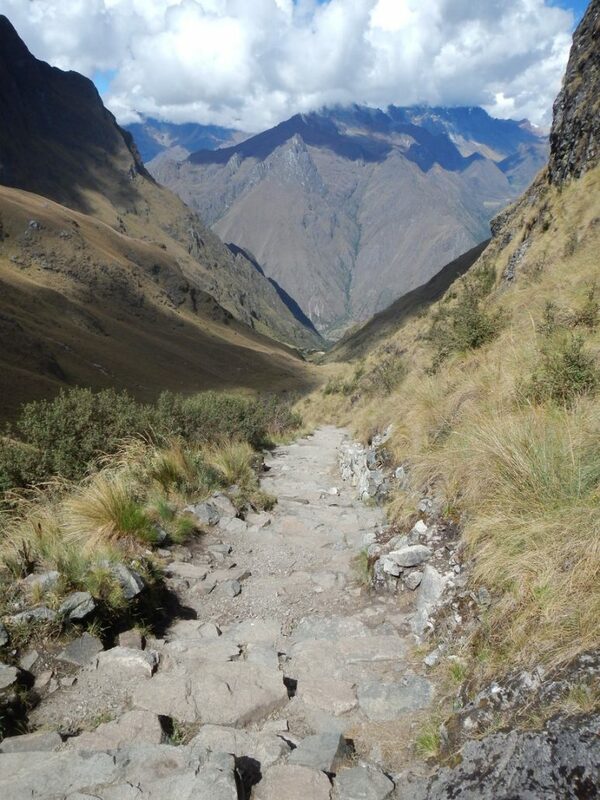 I recall the start of the Inca trail, exhilaration raging through my body. 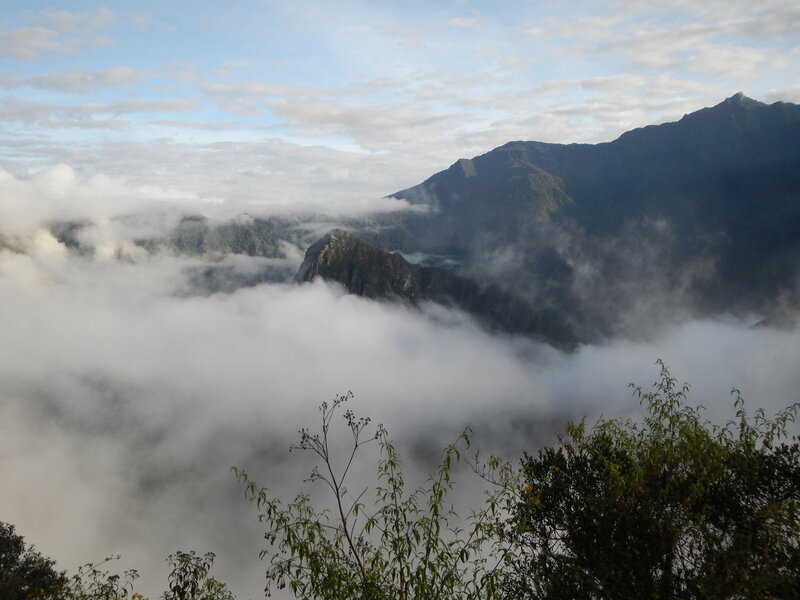 Since then, we’ve stopped at countless extraordinary viewpoints and entered several monumental Inca ruins. Hard to imagine they were able to build those massive constructions thousands of years ago. When we arrive at the classic photo stop, the sun gently peeks through the clouds. The mountain is still in hiding mode, but by now our final destination is easily recognizable. 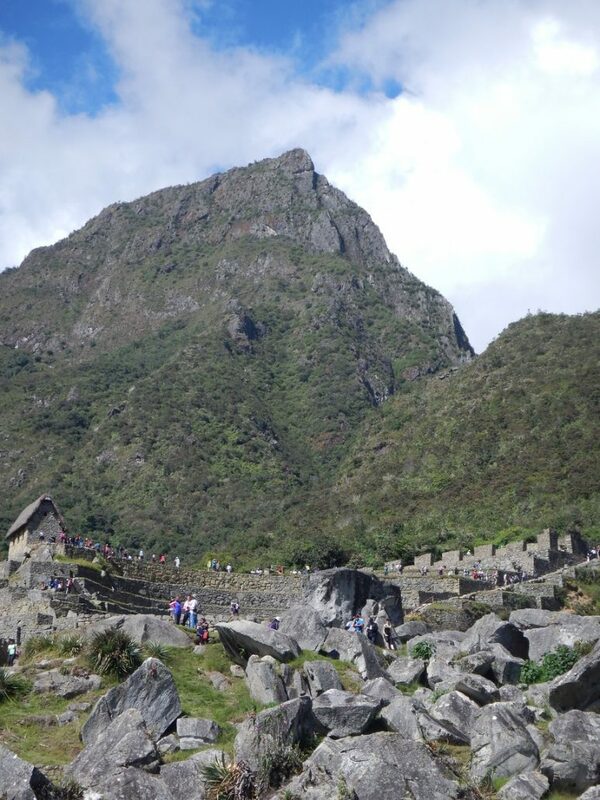 We tour Machu Picchu and I attentively take in the overload of historical information. I touch as many parts of the citadel as I possibly can. I gaze at every corner at least twice. The place is overcrowded with tourists, but I’m so focused I hardly notice. And finally, the long- awaited stamp (“I’ve been here!”) makes its way into my passport. At the end of the visit, my travel companion and I hike back to the picture stop. By now the sun has replaced the clouds with her intense beams. All of a sudden, it has become a picture perfect. For the next two hours, I sit, watch, listen. Wordless. 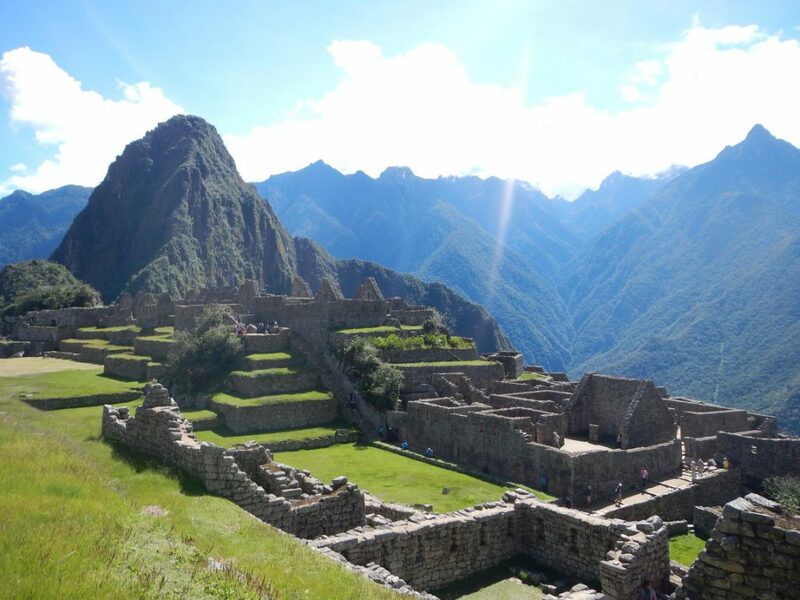 What I wish I knew before departing – preparation is nothing when it comes to the magic of Machu Picchu. Want your travel story to last a lifetime? Get in touch and let Wordrobe pen your finest memories.